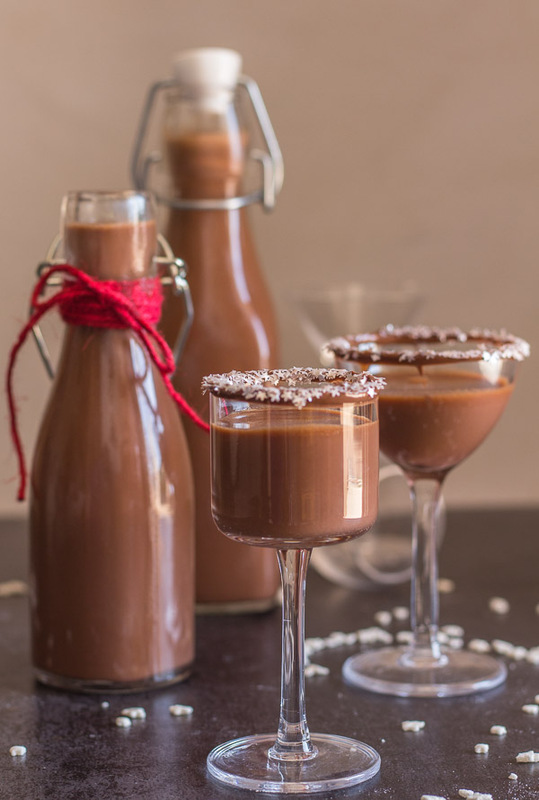 Homemade Creamy Nutella Liqueur, a fast and easy liqueur. The Perfect Holiday drink. Creamy and Chocolatey, so good. 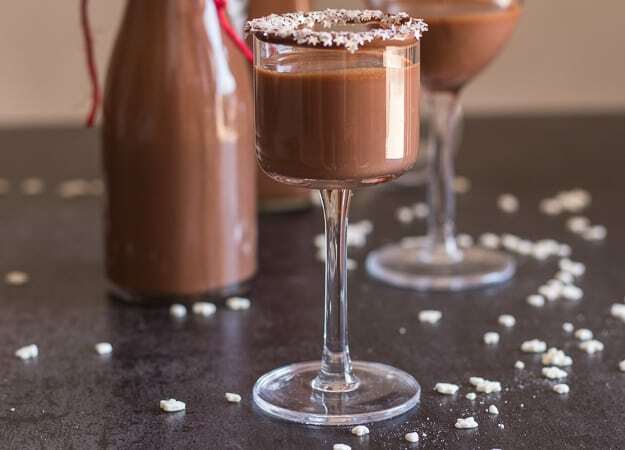 Nutella Liqueur, this simple Homemade Creamy Decadent Liqueur has become our new favourite. I have always been a big fan of Baileys, but after I made this and then we tasted it. We both decided it could easily become this year’s Holiday Liqueur. Friends and family are loving it too! 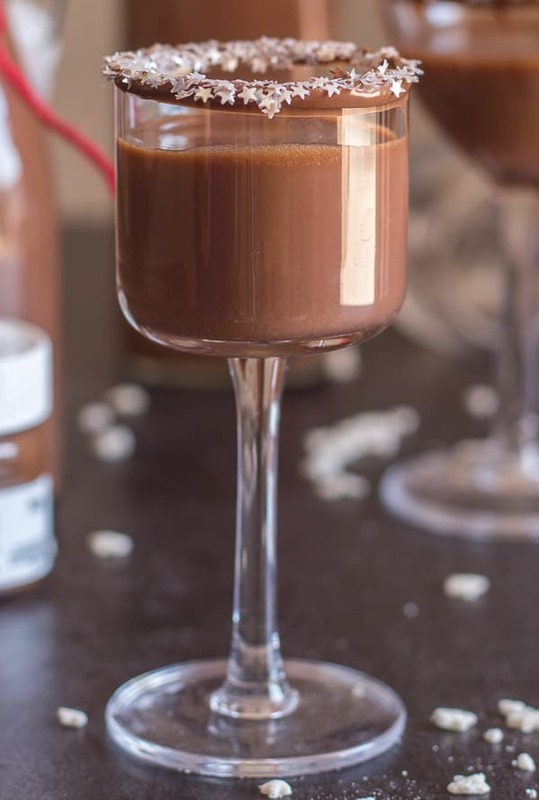 If you love creamy liqueurs like Baileys then you are going to love this Nutella Liqueur or as they call it in Italian Nutellino. And unlike Limoncello you don’t have to let it sit for a few weeks, just leave it in the fridge for a few days and serve. So good. 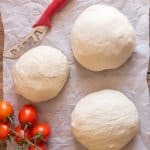 If you like it really cold like me you can even keep it in the freezer just make sure to leave it at room temperature for about 10 minutes before serving. Sometimes it hardens a bit on top, just shake it up and serve. 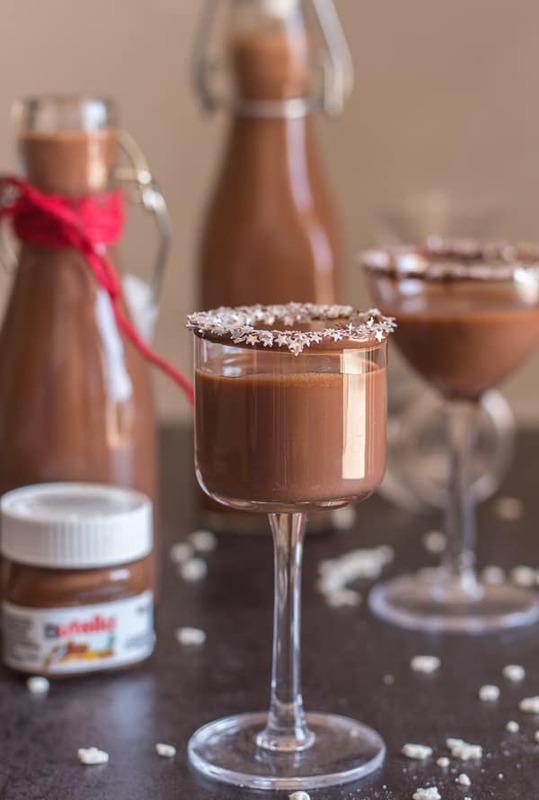 Ours certainly didn’t last 2 weeks but be sure to conserve this Creamy Nutella Liqueur in the fridge, and it can last 1-2 weeks. 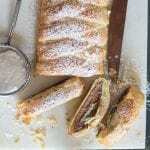 More Nutella Recipes you many enjoy! 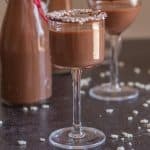 So if you are looking for a creamy Liqueur to share with friends and family I hope you enjoy this Nutella Liqueur or why not give this other Creamy Chocolate Liqueur a try. Enjoy! Hi Felicity I don’t think it would work, because you are making a liqueur, so I don’t think you can make it with another liqueur. 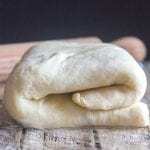 You could try making it with gin or brandy. Hope that helps. Making this recipe right now for my Gingerbread House decorating party tomorrow. It looks so festive and yummy! Putting it in a bright red bottle! Thanks for sharing. Hi Kim, thanks, I hope you enjoy it and have fun. I love the red bottle idea. How much Nutella in a jar did you use up? Can you use an entire 750g jar. I sure didn’t think Vodka + Chocolate would be a good combination. Hi Sery, the recipe calls for 300 grams of Nutella so no you can’t use the whole jar. Hope that helps. I can’t wait to make this as Christmas gifts this year!! Quick question, did you have to use a particular proof of vodka (80 proof, 100 proof?). Only reason I ask is that in Canada, you can’t get those high proofs as the LCBO. I am so excited to make this for the holidays! Thank you for sharing! Hi Annie thanks so much, hope you enjoy it. 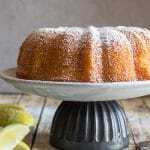 Can you make a large batch and leave un refrigerated similar to limoncello . Hi Sal, no it has to be refrigerated and it only lasts about 2 weeks in the fridge. Hope that helps. Oh my, is there a lactose free version of this? This must be delicious! Hi Angel, well I know there is lactose free cream and milk but Nutella unfortunately is not dairy free. Sorry. Lovely idea! I can’t wait to try. What are/where did you get the garnish around the glass?